Hello! 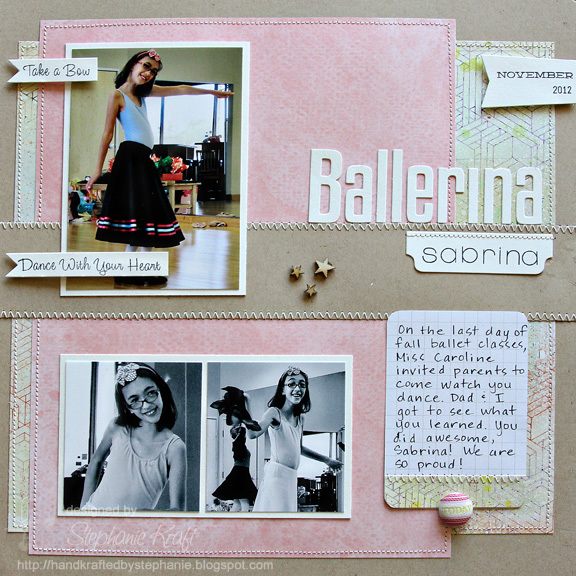 Today I have a scrapbook page with some of Sabrina's latest ballet pictures. 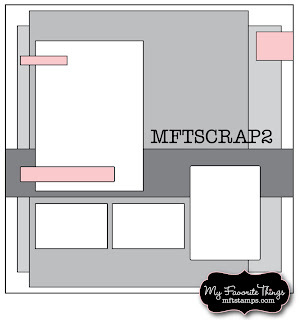 I used the latest scrapbook sketch from My Favorite Things, MFTSCRAP2. I started with a Kraft cardstock base layer. My patterned papers are from the Studio Calico 34th Street Main Kit. Here are some details. 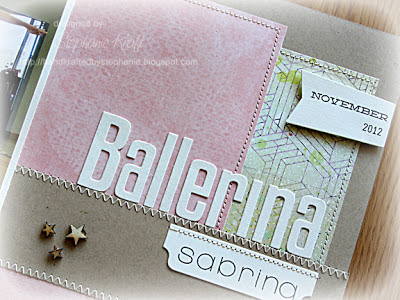 I created my title by stamping Sabrina onto the Die-namics File Tab using the Banner Day Alphabet. 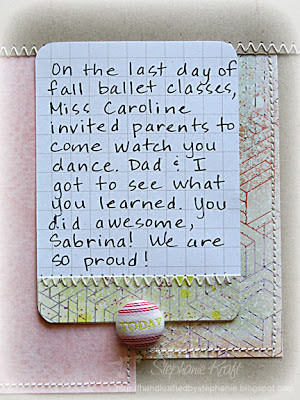 Ballerina was created with the High-Rise Alphabet Uppercase and High-Rise Alphabet Lowercase. In the upper right, I used the LLD Accent It - Tags and Flags and stamped November (from LLD Journal It - Calendar Basics) and 2012 (from LLD Document It - Days and Dates). I also added a few Studio Calico wood veneer stars. I used the Die-namics First Place Award Ribbon Die for my two flags above. 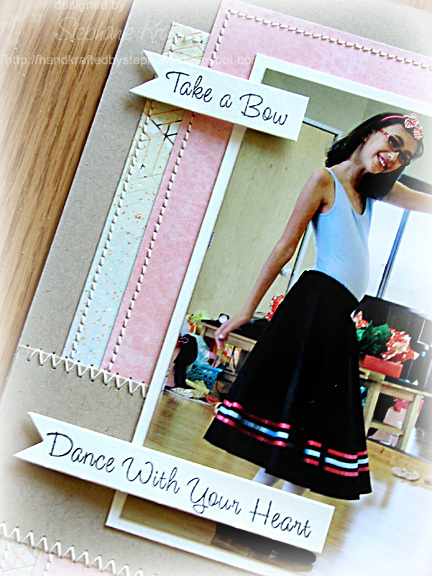 "Take a Bow" is from Sweet Spring Jolinne and "Dance With Your Heart" is from Winter Recital Jolinne (both retired MFT stamp sets). Both are up on foam tape. Finally, a closer look at my journaling, which was handwritten onto a Project Life 3x4 grid card. The "Today" fabric brad is from Dear Lizzy (and part of the Studio Calico kit). Accessories: Die-namics: File Tab, First Place Award Ribbon Die, High-Rise Alphabet Uppercase, High-Rise Alphabet Lowercase, LLD Accent It - Tags and Flags (MFT); Wood veneer stars (Studio Calico), Today brad (Dear Lizzy + American Crafts), 3x4 grid card (Project Life), Foam tape, Thread, Sewing machine. Love this page, Steph!! Great details. Such a beautiful layout!!! Good luck to Sabrina in her Nutcracker performance!! Or is break a leg - lol!! Have fun!